Lock in the date. Seriously. 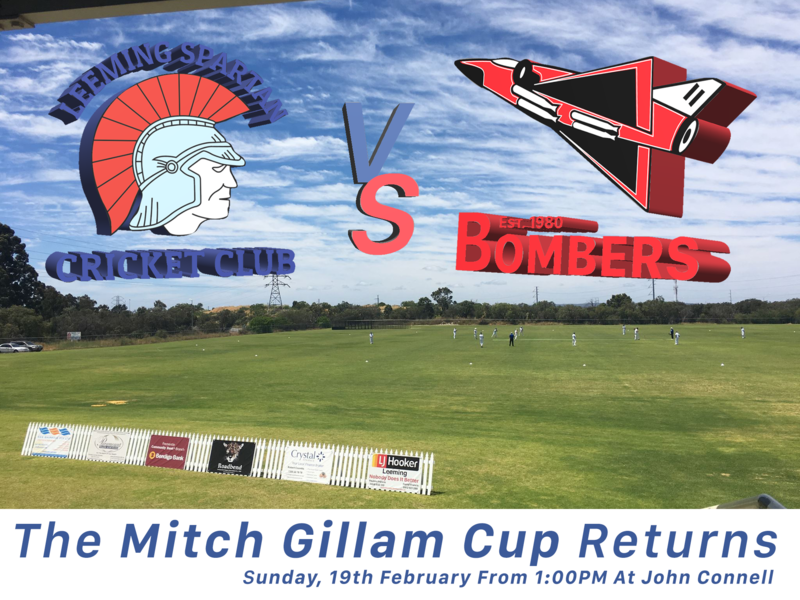 The Mitch Gillam Cup returns on Sunday the 19th of February for our biggest Spartan v Bomber clash yet. 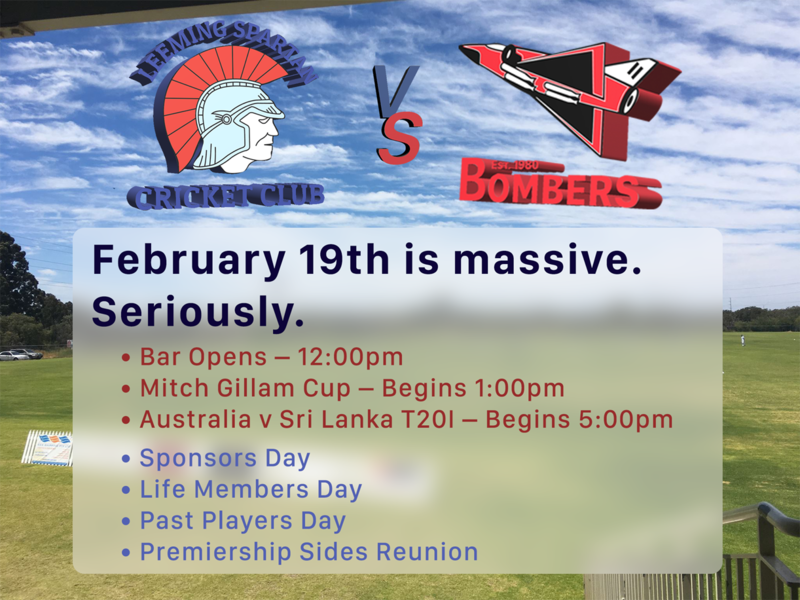 A Twenty-20 matchup between the two prime sporting clubs in the greater Leeming area – the Leeming Spartan Cricket Club and the Bullcreek Leeming Amateur Football Club is on once again, and this season, we’re going all out! We’re expecting well in excess of one hundred attendees from all over, and we want you to come down and enjoy the fun on what is a massive day on the sporting calendar. And this year, we’re quadrupling the action by hosting our Sponsors, Life Members, and Past Players days during the event – meaning we need as many Spartans as possible to get down and make an already huge day even bigger! Mitch’s parents Ken and Sue will also be attending the match, and we highly encourage you to come down and meet them in person. Of course, the infamous Spartan bar will be open all day from 11:30am until late, catering for all patrons and attendees. And, with drinks from just $4.00, you cannot go wrong! Food, lunches, and more will also be available throughout the day’s action, with the Prez’ renowned Jurien Bay Squid set to make a return! Plus, with the conclusion of the T20 action live from the hallowed John Connell turf, we’ll head straight to the telly to watch the second T20 International between Australia v2.0 and Sri Lanka! We Can Think Of Worse Ways To Spend A Sunday! The Mitch Gillam Cup is an annual matchup between the Leeming Spartan Cricket Club and Bullcreek Leeming Amateur Football Club. The match itself serves to honour the life of one of our own in Mitch Gillam, a fantastic member of both clubs, whose life was tragically cut short whilst on holiday in Bali in December 2010 at the age of twenty. You can learn about Mitch by clicking here. As previously mentioned, Mitch’s parents Ken and Sue will also be attending the match. The match also serves as our 2016/17 Sponsors Day, the day on our calendar where all our members come down to show our support for the organisations that have supported us this season. We’ve got a full write up about our Sponsors Day here, and we’re expecting almost all of our fantastic Sponsors in attendance! The reason we’re combining the events is that it allows for our members to be present at the clubhouse during the day, thereby allowing us to show our appreciation of our wonderful 2016/17 sponsors to the full extent. The contribution our Sponsors make year on year is unparalleled, and is the most significant reason as to why we can continue to enjoy low membership, cheap drinks, and great initiatives throughout the season! So, we’re asking all members and friends of the Club to get down and show our support of our wonderful 2016/17 sponsors, say thank you, and get to know the faces of our biggest supporters. They have allowed us to enter our 99th year stronger than ever, and for that, we thank them immensely! Our Life Members Day will also be taking place during the Mitch Gillam Cup, allowing all Life Members the opportunity to come down and enjoy the action alongside all other club members! It is also allows our Life Members who are actively playing in season 2016/17 the chance to enjoy the fun! With the Bullcreek Leeming Amateur Football Club expected as always to bring a great crowd, it is highly important that we Spartans do the same! We’re asking that everyone, and we mean everyone, who has ever been associated with the Leeming Spartan Cricket Club come down and help make February 19th a fantastic day! We’re also very keen to get any premiership sides from years past back together, recreate those famous photographs and make it a fantastic day! With the first ball to be bowled at 1:00pm, be sure to get down in the lead up to the event, with the bar opening at 11:30am. We’ve got plenty of action in the lead up, and with our Sponsors and Life Members in attendance, it is a perfect opportunity to meet and greet and exchange stories! Hacky’s mini-olympics is also set to return after the match, so do not miss out! Keen To Play? Contact Coombsy! Our Spartan invitational eleven is beginning to take shape, so if you are interested in strutting your stuff in front of a large crowd, then be sure to contact Daniel Coombs on 0438 005 493 as soon as possible to nominate your availability. There is no requirements in terms of eligibility to participate, other than a player must have played at least one game for the Club in the most recent season. 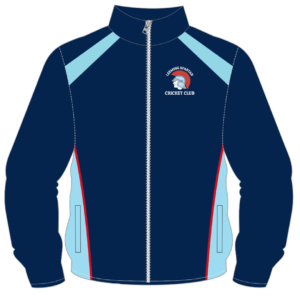 For example, a player wishing to play for Leeming Spartan must have played at least one game for the Club this season. Some members are eligible to play for both sides, and are given the opportunity to choose the team they wish to play for. Where do your allegiances lie! ?